Tucked away in the Horn of Africa, diminutive Djibouti offers ethereal landscapes, traditional tribes and mega marine life by the camel load – little wonder this slice of East Africa is being touted as the next big thing. Refreshingly devoid of large-scale tourist developments (for now, at least), you won’t find international hotel chains outside the eponymous colonial capital. Tourists are still something of a rarity and it is not uncommon to be invited into a family’s home to share a pot of tea. Contrasting strongly with the bright blue skies and the colourful macawis worn by locals, the flat plains outside Djibouti City have a harsh and otherworldly aesthetic, which are celebrated by the local tribespeople in poetry and song. 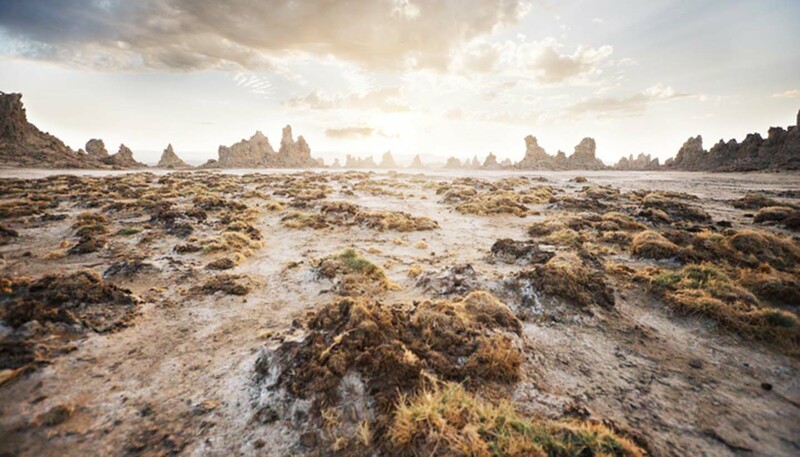 The loose rocks that litter the khaki-coloured ground amid semi-wild herds of camel speak of the country’s volcanic past. Away from the capital, which is wafted by a cool Red Sea breeze, Djibouti becomes oppressively hot in the summer months. Locals move slowly and purposefully; at least until the daily delivery of khat, a semi-narcotic plant chewed like gum, which seems to stop daily life in its tracks. If you do manage to defy the heat, there are ample opportunities to connect with the natural world. Visitors can scale the dormant Ardoukoba volcano, explore Lake Assal, the lowest point in Africa, or go snorkelling with whale sharks in the Red Sea. Found in the Bay of Ghoubbet, these slow-moving giants trawl the Djiboutian coast, gorging on plankton. Exhibiting a blend of African and Arabian culture, the people of Djibouti are equally fascinating. Gracious and welcoming to foreigners, their country still largely works along tribal lines, but it is quiet, unthreatening and small enough to get to grips with. Above all else, though, it’s absolutely stunning. 23,200 sq km (8,958 sq miles). President Ismail Omar Guelleh since 1999. Prime Minister Abdoulkader Kamil Mohamed since 2013. Terrorists are likely to try to carry out attacks in Djibouti. Attacks can’t be ruled out and could be indiscriminate, including in places frequented by expatriates and foreign travellers. Djibouti remains one of the main routes for those fleeing the conflict in Yemen. Limited arrangements are in place to facilitate onward travel for British nationals arriving in Djibouti. However, the UK government’s ability to help is limited and you’ll be expected to cover the cost of visas, accommodation, insurance and onward travel yourself. Any travel options you pursue are taken at your own risk. Consular support is limited in Djibouti as there is no British Embassy. The British Honorary Consul in Djibouti can only offer limited help. However, the British Embassy in Addis Ababa, Ethiopia can provide consular support to British nationals. If you need consular assistance you should contact the British Embassy in Addis Ababa. If you’re in the UK and worried about a British national in Djibouti, call +44 (0) 20 7008 1500. Be aware of the risk of banditry if you travel outside the capital city. Petty crime is not uncommon in Djibouti. Don’t walk around town alone late at night. Keep valuables, particularly cameras and passports, out of sight. The FCO advise against all travel to the border with Eritrea. In 2008 there were military clashes between Djibouti and Eritrea after an incursion of Eritrean forces into the disputed Djibouti border region. The situation remains fragile and further conflict is possible. In February 2016, there was an attack by rebels on a gendarmerie station at Lac ‘Assal, central Djibouti. Three people are reported to have been killed.Take great care if you travel to remote areas of the country, including the border with Somaliland, in the north-west of Somalia, where the presence of security forces is low. Avoid travelling outside city centres after dark; vehicles often have no lights and livestock may be on the roads. Roads are narrow, poorly lit and maintained. Police set up wire coils as roadblocks on some of the major roads, which are not clearly visible at night. Land mines are common in the northern districts of Obock and Tadjoura and the southern district of Ali Sabeih. A new railway line from Djibouti to Addis Ababa opened on 5 October 2016 and is now operating a passenger service. There have been no reported safety incidents. The threat of piracy related activity and armed robbery in the Gulf of Aden and Indian Ocean remains significant. Reports of attacks on local fishing dhows in the area around the Gulf of Aden and Horn of Africa continue. The combined threat assessment of the international Naval Counter Piracy Forces remains that all sailing yachts under their own passage should remain out of the designated High Risk Area or face the risk of being hijacked and held hostage for ransom. For more information and advice, see our Piracy and armed robbery at sea page. Terrorists are likely to try to carry out attacks in Djibouti. Attacks could be indiscriminate, including in places frequented by expatriates and foreign travellers. Djibouti and international interests within Djibouti (including several military bases and personnel) may be seen as a legitimate target by Al Shabaab because of its support to the Somali government and its participation in the African Union peacekeeping mission AMISOM. Al Shabaab has previously issued public threats against Djibouti. In May 2014, they claimed responsibility for a suicide bombing at La Chaumiere restaurant in Djibouti city, which killed 3 and injured many more, including foreign nationals. Be vigilant at all times, especially in crowded areas and public places like transport hubs, hotels, restaurants, shopping areas and bars, and during major gatherings like sporting or religious events. Previous terrorist attacks in the region have targeted places where football matches are being viewed. Follow the advice of local authorities, take care while travelling around the country and avoid large gatherings. Djibouti has a predominantly Muslim population. You should dress in a conservative manner. Drinking alcohol is permitted, but drunken behaviour could result in a two-year prison term. Homosexual behaviour is illegal. See our information and advice page for the LGBT community before you travel. During Ramadan you should show respect to those who are fasting and take care not to offend Islamic values. Photographing infrastructure (such as ports, public buildings, airports, military facilities and bridges) is prohibited. Your equipment will be confiscated and you could be arrested. When taking photos near prohibited places you should take care and seek local advice if you are unsure. French, Arabic and Somali are widely spoken. British nationals need a visa to enter Djibouti. You should get a visa before travelling. Applications may take several weeks to process and should be made well in advance of travel. Visas on arrival are issued at the discretion of the Djibouti immigration authorities. You must also have evidence of your onward journey. Your passport should be valid for a minimum period of 6 months from the date of entry into Djibouti. UK Emergency Travel Documents (ETDs) are accepted for entry, transit and exit from Djibouti. In 2015 UNAIDs assessed that there were around 9,900 people living with HIV in Djibouti and HIV prevalence among adults aged 15-49 years old was 1.6%. Fewer than 1 in 5 has access to antiretroviral medicines. You should exercise normal precautions to avoid exposure to HIV/AIDS. If you need emergency medical assistance during your trip, dial 35 09 62 or 35 27 12 (switchboard) and ask for an ambulance. You should contact your insurance/medical assistance company promptly if you are referred to a medical facility for treatment. From May to October the climate is very hot and dry. Below average rainfall in the past 4 years to 2018 led to many regions in East Africa area experiencing a severe drought including Djibouti. You may experience difficulties travelling overland. Local services and the availability of food and water could be affected. Djibouti is in an active volcanic and earthquake zone. To learn more about what to do before, during and after an earthquake, see the website of the US Federal Emergency Management Agency. There was intense rainfall across Djibouti in May 2018, leading to flash floods and damage in Djibouti City. Credit and debit cards are not widely accepted. Mastercards are not accepted in any businesses, even the biggest international hotels. ATMs are normally available in Djibouti City (though it can be hard to find one that accepts Mastercard). You should make sure that you carry sufficient hard currency.